This is a summary of the 1904 & 1905 services provided by Dr. Mae H. Cardwell for the family of Louie Ling Heung, father of Louie Chouey. “Dr. Mae H. Cardwell, witness statement, ” 1911, Chinese Exclusion Act case files, RG 85, National Archives-Seattle, Louie Chouey case file, Portland, Box 13, 2385. Dr. Mae Cardwell delivered many Chinese babies and cared for their families in Portland, Oregon. She frequently was called on as a witness to verify the identity of her Chinese patients and confirm the details of births, illnesses, and deaths. She kept impeccable records and had a good memory for details. On 6 May 1911 Inspector John B. Sawyer interviewed Dr. Cardwell about Louie Chouey, son of Louie Ling Heung. Cardwell told the inspector that she had known Louie Chouey since he was a little child. She attended his mother when she was sick and delivered two of her younger children, a son and a daughter. The little girl, Long Hoo, died in 1904.The mother died from tuberculosis in 1905. 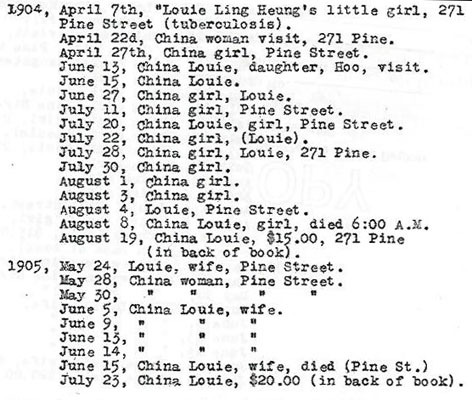 On 6 June 1911 Dr. Cardwell was sworn in again and gave the inspector a summary of her records pertaining to the Louie Ling Heung family from 1904 and 1905. She said since her first testimony her suspicions had been aroused about the identity of Louie Chouey. She was no longer certain that the applicant was who he claimed to be. For a biography of Dr. Mae Harrington Cardwell’s impressive career go to National Library of Medicine. None of her biographies mention her work with the Chinese community.